Whining, like nothing else, gets under my skin! My family is learning this well. When the whining wells up, my patience is tested and I am tempted to let my anger control my reaction. What can be done about this? Let’s first think about how God deals with our complaining hearts. I am often amazed at the level of patience God has with us. 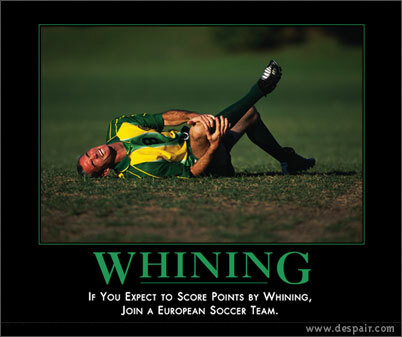 Billions of people all around the world are constantly whining and complaining. People question the goodness of God when they see so much suffering around the world. I think those people must not have children of their own! If they did, they would quickly justify their own wrath! God has every right to not let even the most “innocent” to live another second. And we cannot accuse Him of wrongdoing because none of us are innocent. Yet His grace, mercy and patience with us abound as evidenced by the fact that we even live another second. In the midst of suffering we can’t always explain it, but we can still recognize that God is compassionate. Now I only have TWO children (with one on the way)!!! If you’re a parent, I’m sure you’ve considered exiling your kids or maybe even nuking them! However, God’s patience with us provides great motivation for us to be patient with our children. God is patient with billions and He provides the patience we need for the few we influence and lead. God is patient, but He also trains us. As parents, we have a responsibility to train our children. When the whining wells up, don’t react…train. When your blood begins to boil, acknowledge it and pray for patience and peace in your heart, then simply and calmly train your children on how to deal with the rotten and festering attitude in their own heart. When you begin to see a bad attitude or hear that manipulative whining voice, have your child take a Break. With young children, as young as two or three years old, have them sit in a particular place, a chair, a carpet square, the hallway, or a bottom step. For older children, you might send them to the parent’s room or to another quiet place. Two differences are important. The child knows that the objective in taking a Break is a changed heart and also the child helps determine the length of time spent in the break place, coming back only when ready for a debriefing. These two differences between Time Out and the Break change the posture of the parent. With Time Out, the parent is the policeman, keeping the child in the chair until the sentence for misbehavior has been served. With the Break, the parent is eagerly waiting for the child to return so that they can debrief and move forward. The Break helps parents address heart issues with children and can become a primary discipline technique. It actually comes from the Bible in the teaching about discipline in God’s family, the Church (Matthew 18, 1 Corinthians 5, and 2 Corinthians 2). The idea is basically this: If you can’t abide by the principles that make this family work, then you can’t enjoy the benefits of family life. The two go hand in hand. This parenting tip was taken from the book, Home Improvement, The Parenting Book You Can Read to Your Kids, by Dr. Scott Turansky and Joanne Miller, RN, BSN. If this tip was sent to you by a friend and you’d like to continue to receive tips yourself, you can sign up atwww.biblicalparenting.org.